September 2015 - For the last few days fine dust has replaced much of the air in parts of Syria, Lebanon, Jordan and Israel-Palestine. 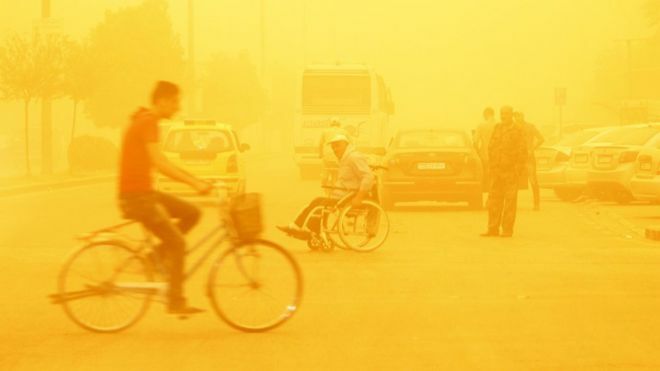 Media has referred to it as a dust-storm, and responded mostly with photos of pedestrians in surgical masks, set against the yellow-grey apocalyptic sky-scape. Cormac McCarthy's 'The Road' as these images may be, this phenomenon deserves more consideration, and firstly more precise nomenclature. There was never a storm, just a heavy dust-cloud which first rose over what used to be Eastern Syria and the Iraqi border, then crept to hide the sun from Damascus, Beirut,, Amman, Tel Aviv and Gaza. At times it was as thick as a heavy fog, blocking view and light, straining airways with fine dust causing almost universal sharp dry cough, hoarse voices and several deaths, so that living in our part of the world has become a somewhat like working in a coal mine. As this is written, on Saturday September 12th, the dust seems to be receding after some four days covering our sky. It has been unseasonal, unexpected and so far, almost entirely unexplained. Phrases like “scientists cannot explain the phenomenon”, usually found in religious propaganda booklets or unlikely sales pitches, appear over and over in the most respectable of news sources. One Israeli politician, an untiring environmentalist, asserted that it must have something to do with global warming, though he didn't care to elaborate on the connection. Conspiracy theorists returned to an old favourite, HAARP, an American government program that conspiracy buffs, as well as a senior physicist involved in the project, suggest might be used to artificially affect weather through high frequency waves (https://en.wikipedia.org/wiki/High_Frequency_Active_Auroral_Research_Program). The suggestion seems to be is that the program has been secretly weaponised and put to use over Syria. If this is true, which there is no particular reason to believe it is, it was secret American plotting on the master-villain level that temporarily grounded the Syrian airforce and allowed ISIS, under cover of dust, to take Syrian government positions, and rebels elsewhere in Syria to take over an airbase. 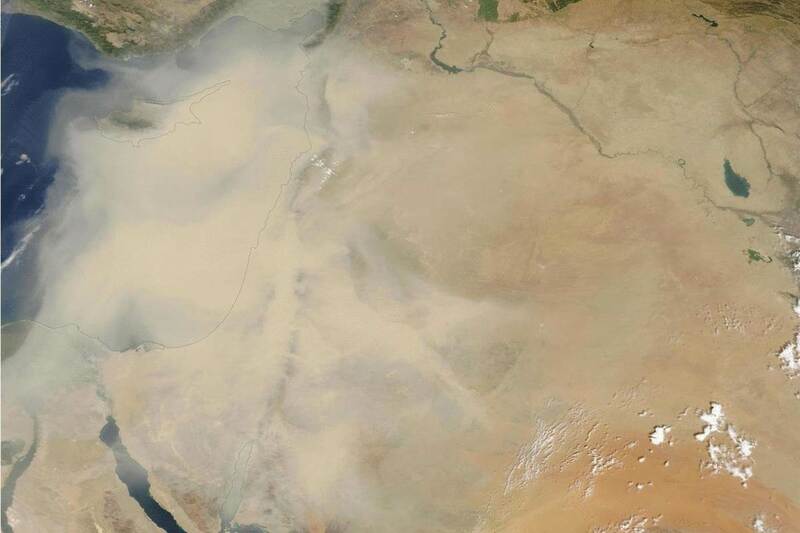 Others have suggested the dust-cloud began from a dustbowl, areas that people have fled from and left unirrigated fields to turn to dust. Though this doesn't explain exactly why the dust spread the way it did, it does connects our weather to our real problems. According to an UNHCR estimate 9 million Syrians have fled their homes since 2011, about 40% of the population (http://syrianrefugees.eu/). It is hard to imagine the scale of that. If it is really this mass departure which has dried the fields and raised the dust, then the cloud blocking our sun and choking of our breath is like the smoke of a fire we are standing to close too, and doing virtually nothing to stop while it rages through our neighbours homes. It takes this blocking out of the sun, this withholding of our breath, to remind us that Syria is not just a problem of European immigration policy, as the media might have us believe. While arguments continue over what to do with that tiny fraction of the escapees who are making it through to Europe, nobody seems to be talking about ways to end the war, about the destitute millions left behind. The fire is raging and we are arguing about where to house the survivors. What about putting the thing out? we seem to have lost all hope and motivation, if anyone ever had any, of doing something about the problem itself. The smoke of the burning Syria will keep choking us even if the dust is gone tomorrow, even if the dust-cloud turns out to be truly the result of American secret weaponry or some other yet unknown cause. Syria has become a man-made volcano spewing destruction and destitution, fuelled by the collapse of Iraq under sanctions, invasion and occupation, by the power games of richer and more powerful countries (the United States and its Oil rich Arab friends on the one hand, Russia and Iran on another) and the continued willingness of the rest of us to avert our gaze from the destruction of human life and potential, from the decimation of a whole country and a whole generation, and keep discussing war as a kind of game, a play of power between nations, or as an unfortunate but unavoidable flaw of some less civilised people. I saw it as sand mixed with Syrian blood.